Welcome to the Casino Answers Keno Guide. Keno is a popular casino game amongst many players, and we aim to be the number one source when it comes to all Keno related information, strategy and advice. Keno is at practically every online casino, however what Keno game you want to play depends on what type of Keno player you are. I mean there’s single card keno, multi card keno, mobile keno – quite the selection. Thankfully, we’ve got you covered. 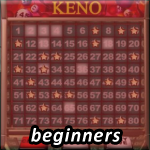 Before even thinking about starting to play Keno online be sure to look through our list and guide of where to play Keno, depending on just what type of Keno player you are. Keno is a great game to play online while browsing the web or watching a movie. Once you’ve finished reading our whole Keno for Dummies guide you’ll be kicking yourself for never trying out Keno before. Keno is a very easy game to play, and one of those great games you can play while doing other things. No complex strategies to learn, no crazy patterns to remember – just sit back and enjoy your own personal lottery game and play at your own pace. 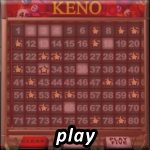 We go into detail about Keno and will have you playing it, online or in Vegas, in no time. 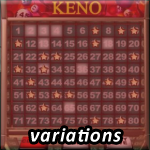 There isn’t too many variations of Keno online – but don’t worry as there are some, and we’ve spent time at all the possible Keno games to try them out and provide information for you. So if you’re looking to try a different type of Keno game then be sure to check out our specific guides and lists, and see what sort of twists online casinos have came up with for Keno. We provide screenshots of each game too and where applicable a link to a free version so you can try it out before playing with real money. 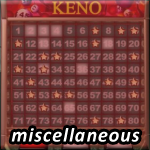 If we didn’t cover the Keno related topic you were interested in above, then I’m sure we have it below in our Miscellaneous Keno section, where we list all Keno articles not listed in the above categories. And if it’s not there? Then contact us with this easy to use contact form, and let us know what questions you have or what Keno related topic you’d like to see covered, and we’ll do our best to cover it promptly.